My brother BigDon (as the Doodlebug calls him) just had a wisdom tooth removed. Being the stereotypical bachelor with only chewable foods in his cooking repertoire he came over to our house to hang out for a couple of days until chewing was approved again. It has been a long time since I’ve had to come up with no-chew to low-chew foods and I was at a bit of a loss. The standby’s of my previous life after something like this would have been Sprite, jello, ice cream and protein smoothies. After doing a bit of research into dry socket prevention (the dreaded complication of tooth removal) I realized that a low refined sugar diet would help to prevent that complication. For his first post surgery breakfast I got a little creative and took some liberties with Nourishing Traditions classic soaked oatmeal recipe. Here is the recipe. Please keep in mind that I am not very exact with my measurements which is bad for those of you that are most comfortable with super precise amounts but good because it allows some creative, user friendly and individual leeway to be had while still producing decent results. 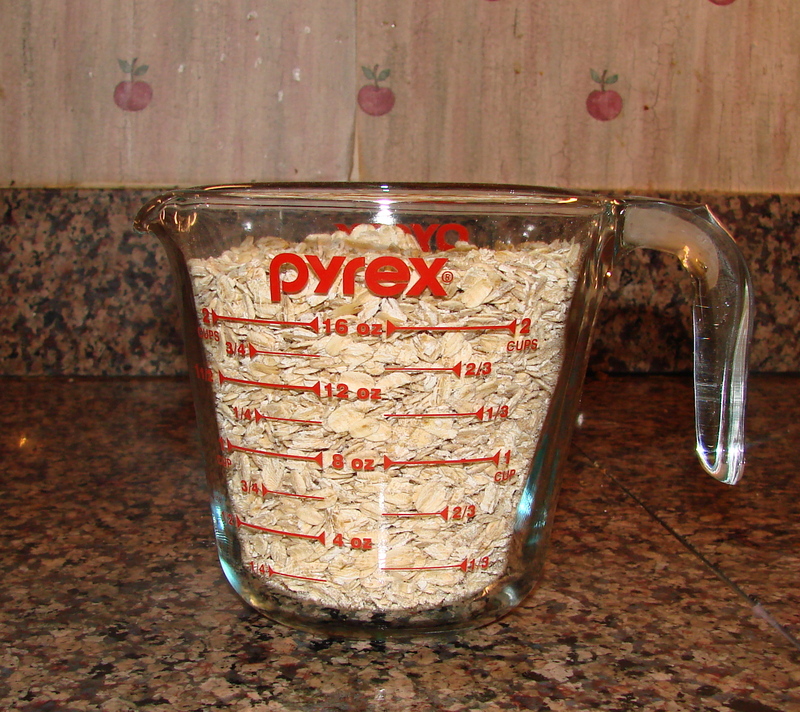 The night before on my way to bed I measured out the oats. The yogurt was then pulled from the fridge…Aaaaaaand discovered to be frozen solid. Note to self: This is why you made that rule a while back not to wait until bedtime to start overnight soaked projects. When something goes wrong it makes you feel cranky and you start projecting sleep deprivation upon yourself. 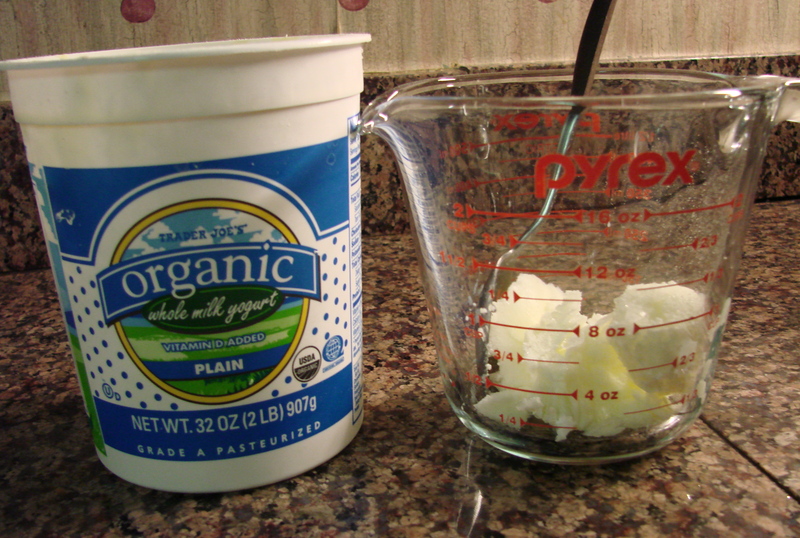 Back to the project…I determinedly chiseled the yogurt out, not wanting to fool with a hot water thawing process. Don’t even suggest the microwave. Remember? I consider those cheating. Although I’ll admit to eyeing it with temptation on more than one occasion. The frozen yogurt was then forcefully mooshed into the oats. 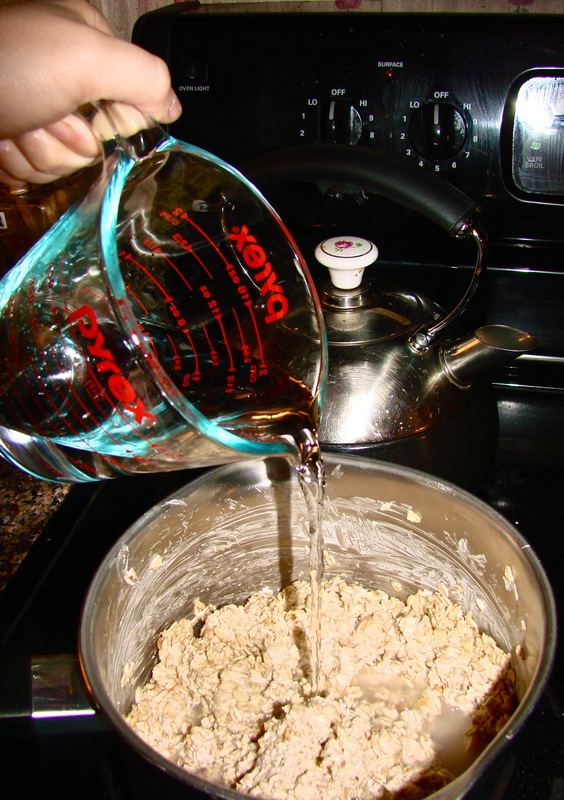 Ideally at this point you would be gently mixing the creamy and un-frozen yogurt in. After the mooshing was complete I threw a lid on the pot and staggered up to bed. Ideally without the mushing step in there it should only take 2 to 3 minutes max to start a whole grain breakfast soaking the night before. And here is an advantage: It cooks WAY faster the next morning. 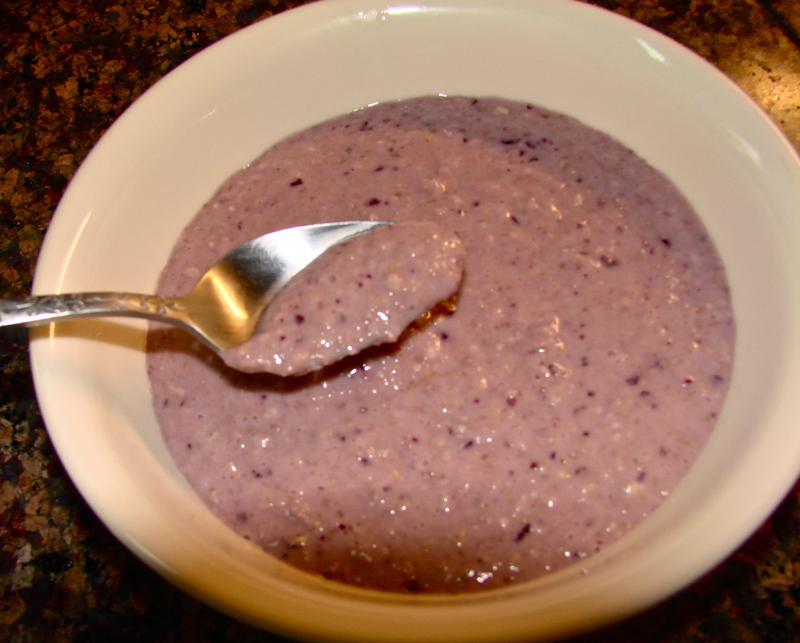 It’s the ultimate way to get a nutrient maximized, next to instant breakfast! 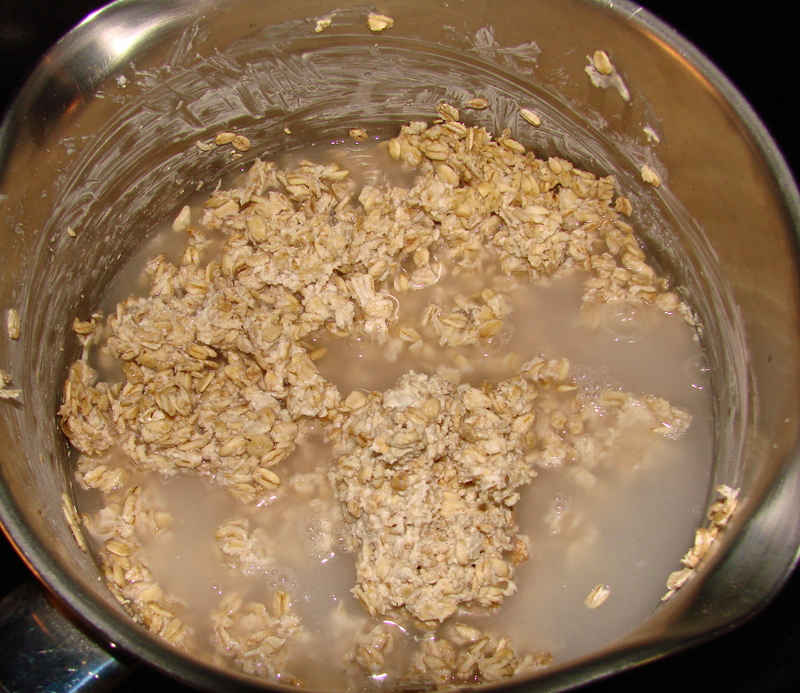 The next morning dump the filtered water on top of the soaked oatmeal. 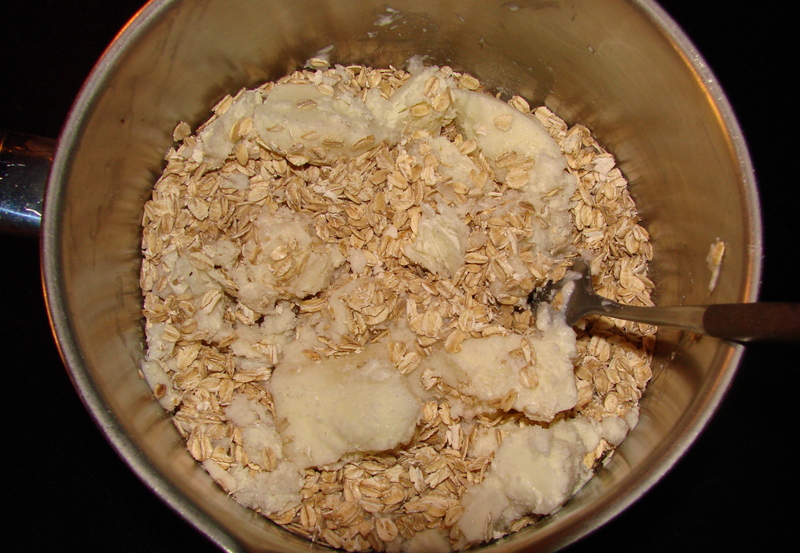 You can see how much softer and creamy the texture of the oatmeal is after soaking through the night. 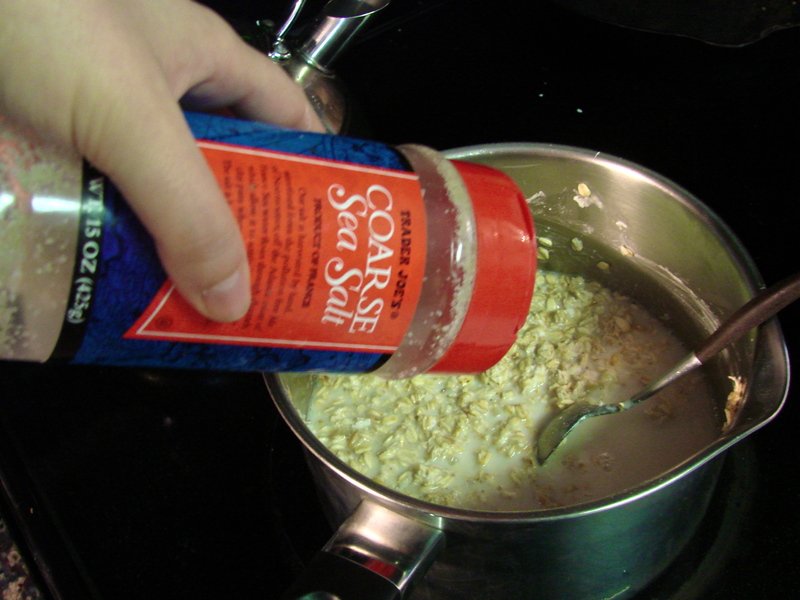 If you will be using un-salted butter now is a good time to sprinkle some in. 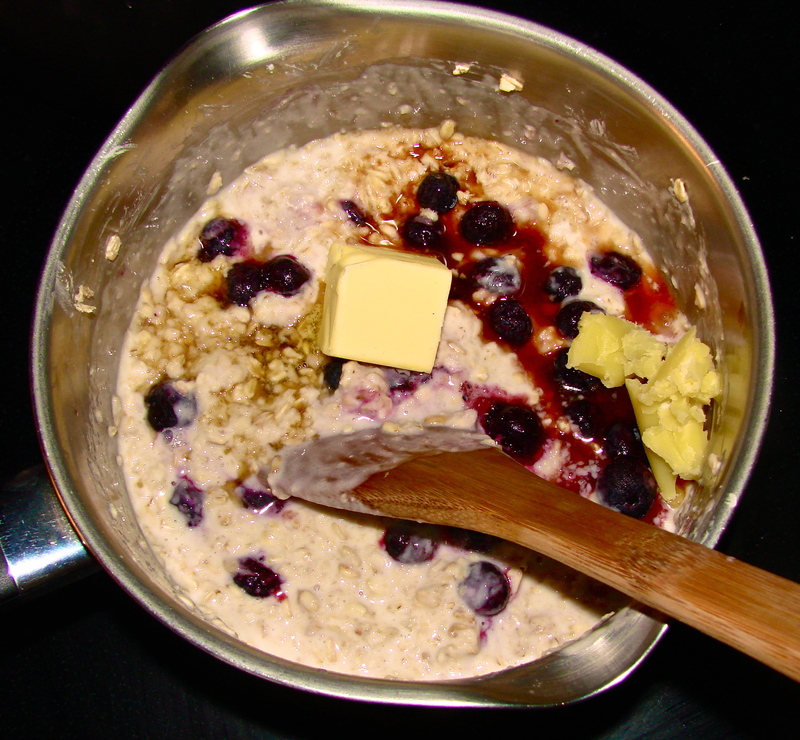 Then cook the oatmeal on medium high heat (while stirring semi constantly) or on medium low heat (takes longer but requires less stirring and less of a chance of scorching the bottom) Once it’s adequately cooked it’s time to throw in the yummy stuff! It is usually completely cooked for me in 5 to 7 minutes. I try to add/sneak in the high vitamin butter oil whenever I can. My family doesn’t like the taste of it by itself spread on things so sneaking it into stuff like this is the best way for me to get it in them. 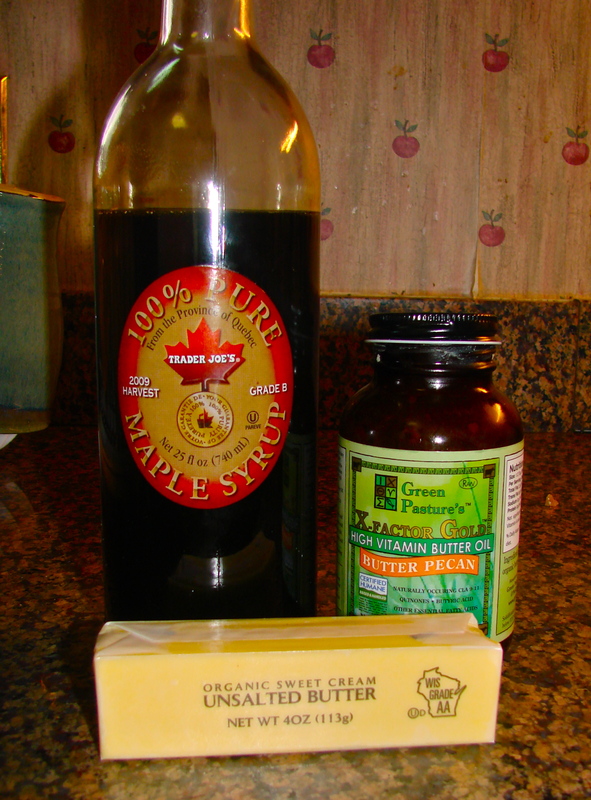 We purchase our high vitamin butter oil here: http://www.homesteadtradingpost.com/high-vitmain-butter-oil-1.html It can also be purchased directly from the Green Pastures Website. I usually throw in some Bee Pollen and Powdered Colostrum for an extra “boost” of nutrition. Next comes the Creamy Dreamy part. 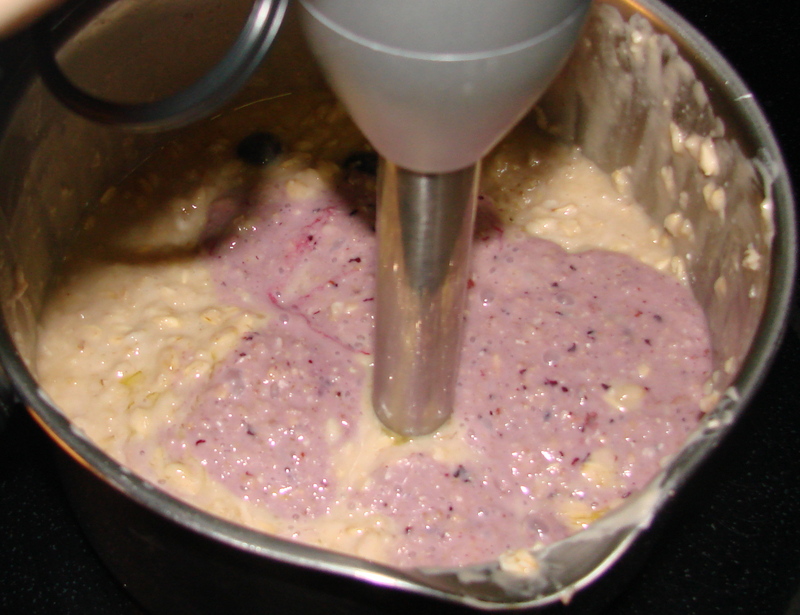 After the butter has sufficiently melted I grab my marvelous hand blender. Seriously, this is one kitchen item I would never want to be without. I paid in the ball park of $35.00 for it brand new and have already gotten about double that in use from it. Can’t beat how easy it is to clean compared to a food processor! As you can see by the finished texture it would be a perfect food for babies. This could be made up ahead of time and frozen in serving sized containers for easy and hassle free baby food.